Its a great look, but now i have no access to my database that i was using. I can’t login with my account ‘watson’ at db4free.net, and i try to dump my database but can’t login. 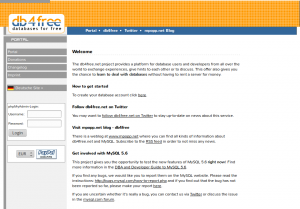 You can access the old server on host db4free.org (rather than db4free.net). The old server will remain available until August 15. You can use phpMyAdmin at http://db4free.org/phpMyAdmin/ to access your pre-relaunch database. Hello, i cannot access to phpmyadmin with my credentials, is there any problem there? db4free.net (new server) or db4free.org (old server)? Are you getting any error messages? Did you register on the new server (db4free.net) already (after the website relaunch and server migration)? Sorry but I dont understand some things. My website isnt working – should I wait or do something? What is wrong with my website? Why it cant connect with my datebase? Should I do something? 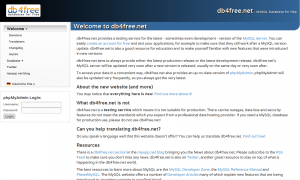 You can switch the host to db4free.org to get it working again, as a temporary solution, until August 15. 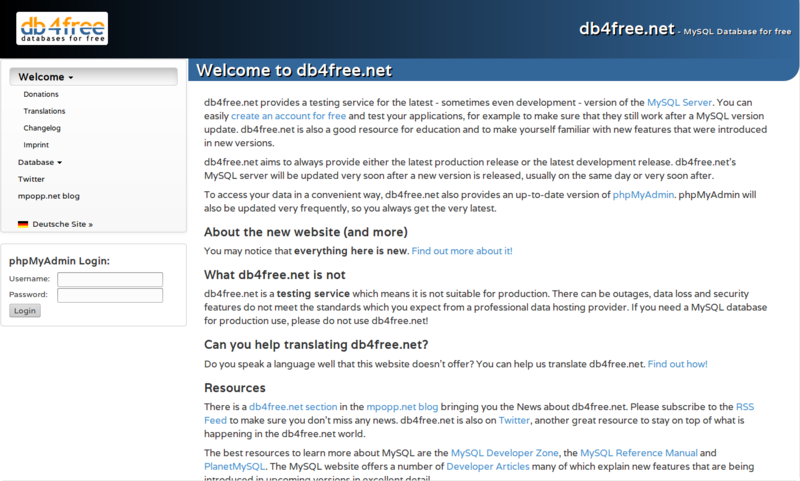 Use http://db4free.org/phpMyAdmin/ to access your data there. Until then you need to migrate to db4free.net, the new server. Sorry but I`m not good at it. Could you tell me how can I switch the host to db4free.org? I tried but I don`t know where. Please explain me this step by step. Could anyone explain me this? In your application you had to somewhere enter db4free.net as the host information in order to connect to the database. 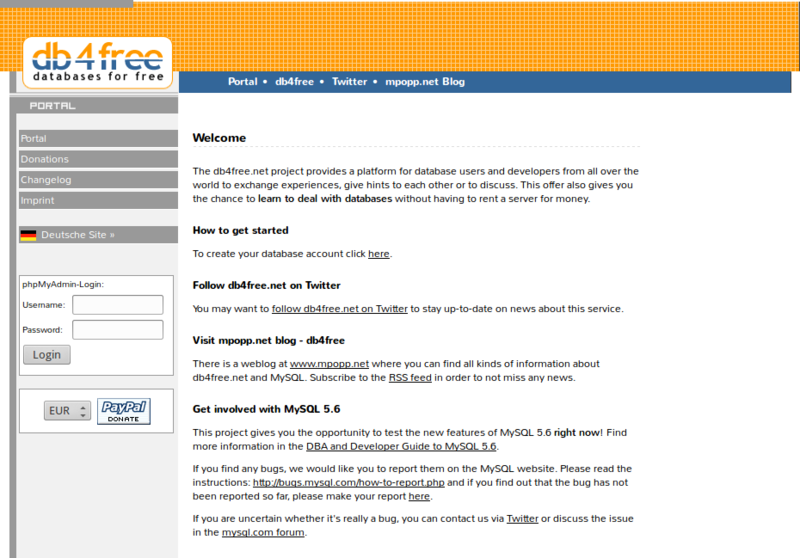 This has moved to db4free.org and will remain available there until August 15 to give you time to migrate your data to db4free.net (after that, db4free.org will be gone). http://www.mpopp.net/2013/02/db4free-net-server-migration/ contains instructions for creating the backup and importing it. This is as detailed as I can explain it. to connect to the old server (which goes away August 15th). I can’t access my data on db4free.org. When I try to login i received the following error: Connection for controluser as defined in your configuration failed. and if I try to backup using mysqldump I receive the code error 2003. Try again, as far as I am aware, everything should be fine again. I registered, but didn’t receive confirmation email. Is it working? There is no ‘resend confirmation email’ option, so I don’t know what else to do but ask you here. Send me an email (find the address in the imprint) using the same email address which you used for signing up. I will send you the activation link manually. Couldn’t find your email address, only your profiles on other pages. Can post it here or link where I can find it? Also I’m providing my email in Email input field in this comment form if that helps. I tested my solution using db4free and it works very well. I would like to know if you could tell me the better production environments that works so well and easily like db4free. There are a zillion providers out there. Germany based https://www.hetzner.de/en/ is one of them where I have some dedicated servers (one of which for db4free.net) and they are quite flexible in terms of their conditions (like you can cancel a server without much notice time). While a dedicated server may be too much for your needs, they also offer webhosting service, which is also much cheaper. While I haven’t tried those with hetzner.de yet, this is one of the zillion choices you have.